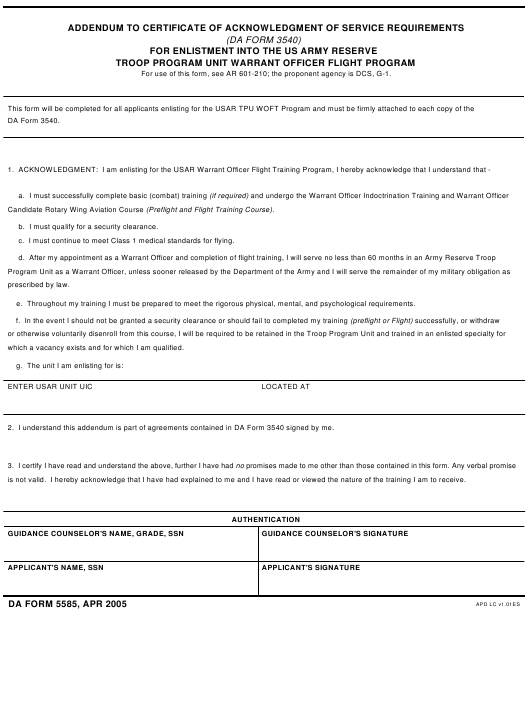 DA Form 5585 - also known as the "Addendum To Certificate Of Acknowledgement Of Service Requirements (da Form 3540) For Enlistment Into The Us Army Reserve Troop Program Unit Warrant Officer Flight Program" - is a United States Military form issued by the Department of the Army. The form - often mistakenly referred to as the DD form 5585 - was last revised on April 1, 2005. Download an up-to-date fillable PDF version of the DA 5585 down below or look it up on the Army Publishing Directorate website. For use of this form, see AR 601-210; the proponent agency is DCS, G-1. Candidate Rotary Wing Aviation Course (Preflight and Flight Training Course). b. I must qualify for a security clearance. c. I must continue to meet Class 1 medical standards for flying. e. Throughout my training I must be prepared to meet the rigorous physical, mental, and psychological requirements. which a vacancy exists and for which I am qualified. 2. I understand this addendum is part of agreements contained in DA Form 3540 signed by me. is not valid. I hereby acknowledge that I have had explained to me and I have read or viewed the nature of the training I am to receive.